, a celebrated anatomist and physician, was descended from a family which had abounded with physicians. 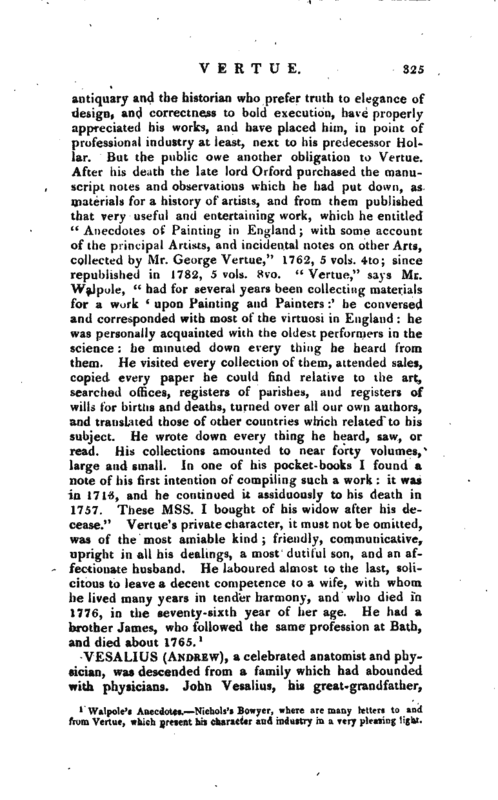 John Vesalius, his great-grandfather, | was physician to Mary of Burgundy, first wife of Maximilian I.; and went and. settled at Louvain when he was old. Everard, his grandfather, wrote commentaries upon the books of Rhases, and upon Hippocrates’s “Aphorisms:” and his father Andrew was apothecary to the emperor Charles V. Our Vesalius was born at Brussels, but in what year seems to be uncertain; Vander-Linden finding his birth in 1514, while others place it in 1512. He was instructed in the languages and philosophy at Louvain, and there gave early tokens of his love for anatomy, and of his future skill in the knowledge of the human body; for, he was often amusing himself with dissecting rats, moles, dogs, and cats, and with inspecting their viscera. Afterwards he went to Paris, and studied physic under James Sylvius; but applied himself chiefly to anatomy, which was then a science very little known. For, though dissections had been made formerly, yet they had long been discontinued as an unlawful and impious usage; and Charles V. had a consultation of divines at Salamanca, to know, if, in good conscience, a human body might be dissected for the sake of comprehending its structure. 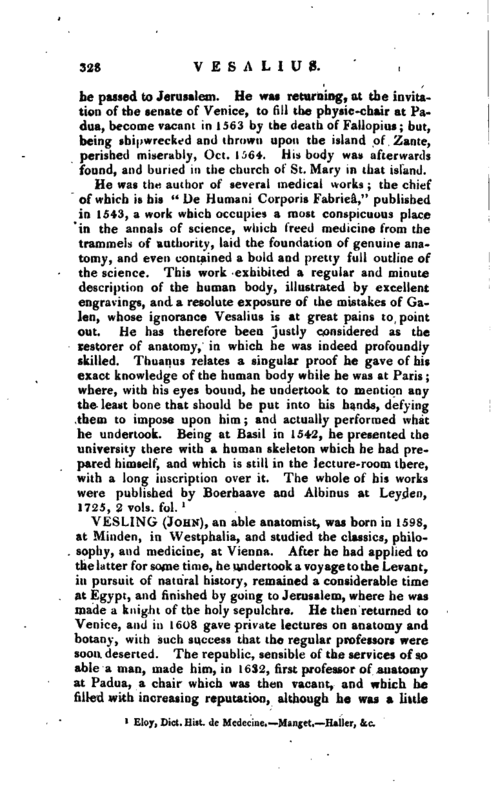 He perfected himself in this science very early, as we may know from his work “De Humani Corporis Fabrica:” which, though then the best book of anatomy in the world, and what justly gave him the title of “the Father of Anatomy,” was yet composed by him at eighteen years of age. 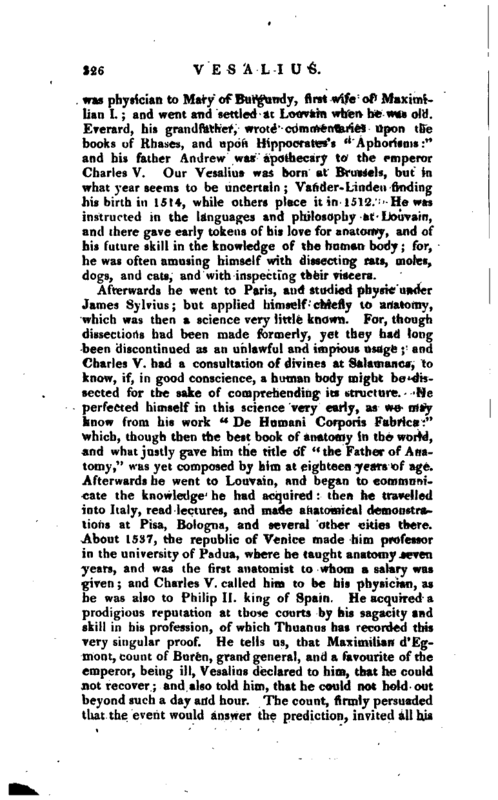 Afterwards he went to Louvain, and began to communicate the knowledge he had acquired: then he travelled into Italy, read lectures, and made anatomical demonstrations at Pisa, Bologna, and several other cities there. About 1537, the republic of Venice made him professor in the university of Padua, where he taught anatomy seven years, and was the first anatomist to whom a salary was given; and Charles V. called him to be his physician, as he was also to Philip II. king of Spain. He acquired a prodigious reputation at those courts by his sagacity and skill in his profession, of which Thuanus has recorded this very singular proof. He tells us, that Maximilian d’Egmont, count of Buren, grand general, and a favourite of the emperor, being ill, Vesalius declared to him, that he could not recover; and also told him, that he could not hold out beyond such a day and hour. The count, firmly persuaded that the event would answer the prediction, invited all his | friends to a grand entertainment at the time after which he made them presents, took a final leave of them, and then expired precisely at the moment Vesalius had mentioned. If this account be not true, it shews at least the vast reputation Vesalius must have risen to, where such stories were invented to do him honour. Vesalius was now at the very height of his reputation, when all at once he formed a design of making a journey to Palestine. Many reasons have been given, and more conjectures formed, about his motive to this strange adventure; yet nothing certain appears concerning it. 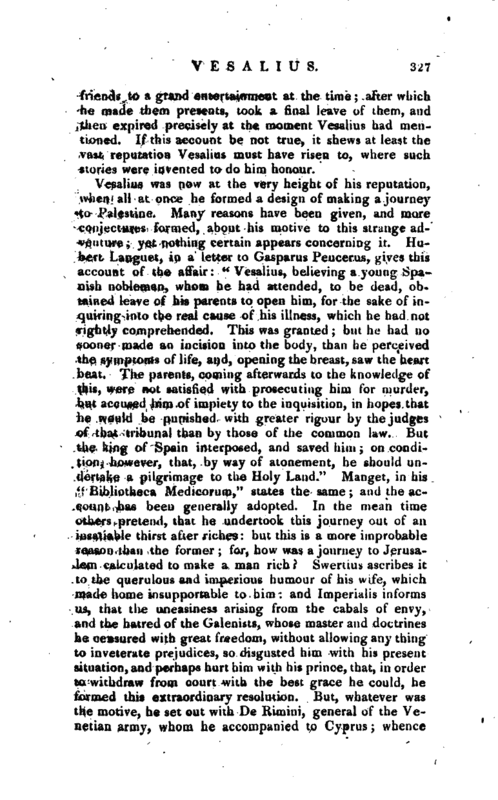 Hubert Languet, in a letter to Gasparus Peucerus, gives this account of the affair: “Vesalius, believing a young Spanish nobleman, whom he had attended, to be dead, obtained leave of his parents to open him, for the sake of inquiring into the real cause of his illness, which he had not rightly comprehended. This was granted; but he had no sooner made an incision into the body, than he perceived the symptoms of life, and, opening the breast, saw the heart beat. The parents, coming afterwards to the knowledge of this, were not satisfied with prosecuting him for murder, but accused him of impiety to the inquisition, in hopes that he would be punished with greater rigour by the judges of that tribunal than by those of the common law. But the king of Spain interposed, and saved him; on condition, however, that, by way of atonement, he should undertake a pilgrimage to the Holy Land.” Manget, in his “Bibliotheca Medicorum,” states the same; and the account has been generally adopted. In the mean time others pretend, that he undertook this journey out of an insatiable thirst after riches: but this is a more improbable reason than the former; for, how was a journey to Jerusalem calculated to make a man rich? Swertius ascribes it to the querulous and imperious humour of his wife, which made home insupportable to him: and Imperialis informs us, that the uneasiness arising from the cabals of envy, and the hatred of the Galenists, whose master and doctrines he censured with great freedom, without allowing any thing to inveterate prejudices, so disgusted him with his present situation, and perhaps hurt him with his prince, that, in order to withdraw from court with the best grace he could, he formed this extraordinary resolution. But, whatever was the motive, he set out with De Rimini, general of the Venetian army, whom he accompanied to Cyprus whence | he passed to Jerusalem. He was returning, at the invitation of the senate of Venice, to fill the physic-chair at Padua, become vacant in 1563 by the death of Fallopius; but, being shipwrecked and thrown upon the island of Zante, perished miserably, Oct. 1564. His body was afterwards found, and buried in the church of St. Mary in that island. Eloy, —Dict. Hist. de Medecine, Mangelt —Haller, &c.